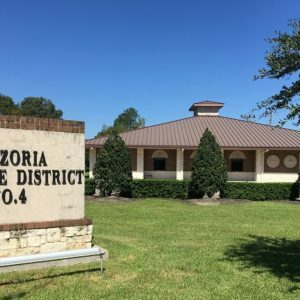 Jurisdiction – Brazoria Drainage District No. 4 encompasses an 83.4 square mile area of northern Brazoria County which includes the Cities of Pearland and Brookside Village. Its boundaries from west to east are Fort Bend County to Galveston County and from Clear Creek (Harris County) to a point just north of Alvin, Texas and Manvel, Texas. Major drainage arteries include: Clear Creek, Hickory Slough, Mary’s Creek, Cowarts Creek, Chigger Creek and portions of Mustang Bayou. Principal subdivisions located in the district include: Country Place, Silver Lake, Southwyck, Crystal Lake, West Oaks, Springfield, Sunset Meadows, Sunset Lakes, Meadow View, Pine Hollow, West Wood, Dixie Woods, and Oak Brook Estates. Brazoria Drainage District boundaries in relation to the City of Pearland and surrounding cities. 4. Schedules labor force and equipment to meet maximum efficiencies and use there of. Operations – To carry out its mission the District employs a General Manager and 70 full time employees whose primary job is to maintain, reclaim and modify the drainage arteries within its jurisdiction.